Well, here I am. Fifty-four days have come and gone since I said goodbye to the Toronto skyline and boarded a plane headed to Thunder Bay. This experience has now come full-circle as I find myself sitting in the Thunder Bay airport lounge and waiting for a flight to take me to Toronto. An early flight from Fort Albany this morning took us on an adventure to pick up teams in Attawapiskat and Peawanuk before landing in Thunder Bay. I am now a few hours into a seven hour layover that has given me some time to catch up with teams from other communities before boarding the plane that will officially mark the end of my Northern adventure. As I finished packing up my things in Fort Albany this morning, I took a few seconds to skim through the pages of my journal. It is hard to explain what the combination of memories tucked away in those pages means to me right now. It is much easier to explain that I could not do much to stop the tears from rolling down my cheeks as I watched the small community disappear beneath me this morning. And maybe that is all the explaining that I need to do right now. At this moment, it is impossible for me to distill final thoughts, lessons, or reflections from my experience as a whole. I know that time will make that easier to do. However, there are many moments from this experience that I feel very viscerally connected to and I will hold these closest as I board the plane to Toronto. Among many others, these moments include participating in a sweat lodge, attending a shaking tent ceremony, sprinting on the airstrip (even though we were not supposed to be there), learning to play euchre, singing songs from RENT at the top of my lungs after a particularly great run, being reminded that kids are kids regardless of their location or circumstance, and recognizing just how much history, knowledge, and life there is in the Northernmost parts of this province. After a late night last night, I pulled myself out of bed at 6:45am to go for one last run around the community. I made sure to include a stop by the river on my route and said goodbye to a landscape that has helped me put things in perspective over the past two months. And although the rest of the morning was somewhat stressful (I managed to lock myself out of the house and we were very behind in our packing when our ride to the airport arrived), this was the perfect way to start the day. I am not sure how I will feel when I land in Toronto or begin reconnecting with friends and family, but I do know that the reality of the past two months is slowly starting to sink in. I found parts of myself this summer that I have been losing touch with in the city. I set goals that have seemed too lofty or ridiculous surrounded by the pressures of everyday life in Southern Ontario. Above all, I was lucky enough to meet many wonderful people and to have had the opportunity to listen and learn. Goodbye Fort Albany. Thank you for an incredible summer. 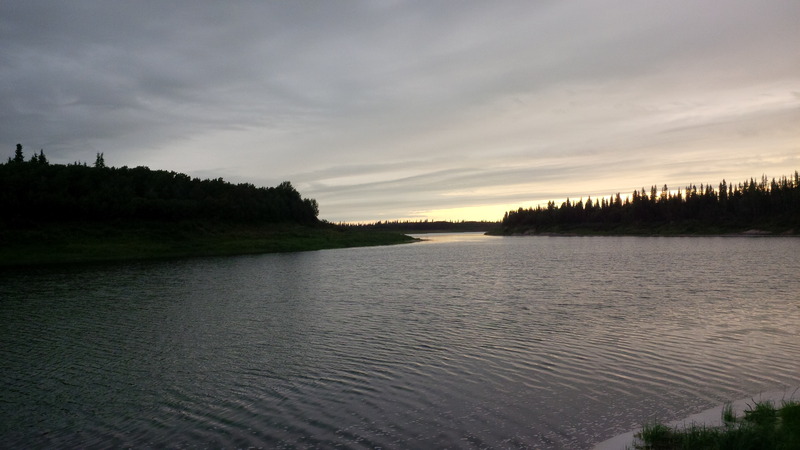 This entry was posted in Fort Albany and tagged First Nations, Fort Albany, Frontier College, Lieutenant Governor's Aboriginal Summer Reading Camp, Northern Ontario, Sunset on August 15, 2014 by nicoledalessandro. Thanks for this blog, Nicole! I was hoping to connect with you to learn about your experience in Fort Albany as my partner and I are planning to spend time with the community there beginning in mid-February. If you have a moment, I can reached at art.p.lee @ gmail.com. Thank you!